Two of Liverpool’s stand-outs, in a charismatic sense, went on camera for another edition of Bezzies, answering questions on each other in hilarious fashion. The Bezzies series from LFCTV has proved a hit, with the likes of Virgil van Dijk and Joe Gomez going up against each other and plenty of others besides. This time around it’s Robbo and Milner, the Scottish national team skipper and the Reds’ own vice-captain—both of whom have forthright views and a dry sense of humour. The result is a typically watchable few minutes with the squad camaraderie and closeness once again on show. On the pitch, Robertson has proven an inspired addition to the Reds’ squad and has locked down the left-back spot as his own—a position briefly filled by Milner, of course. Now more often back in his usual midfield role, Milner’s versatility is often on show to cover either a wide flank role or at full-back, with injuries of late meaning his experience and tactical diligence has been required all over the pitch. Both players were also, of course, critical to the Reds’ run to the Champions League final last season and were starters in Kyiv. On the pitch they are both industrious, determined and not afraid of a big tackle—but in front of the cameras they both show a much more humourous side. We learn about Milner’s goalscoring feats early in his career and Robbo’s breakfast habits—anything in a roll, confides Milner—and there’s an incredible answer to which player was the first name-and-number the midfielder had on the back of a shirt as a kid. There’s also a discussion on the worst cards player in the squad and the worst pool player, while the social media habits of both come under scrutiny too. 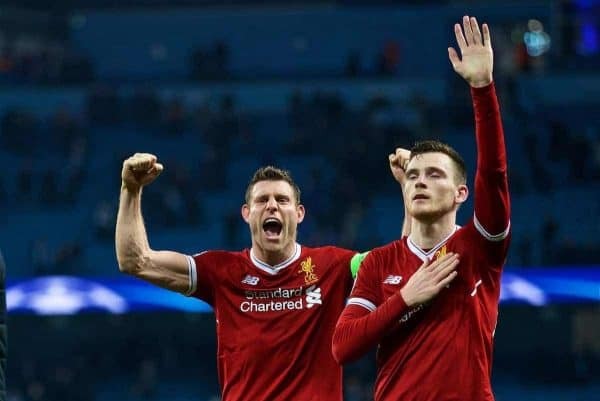 Milner in particular has become something of an iconic figure on Twitter with his hilarious approach to social media, but Robertson’s historical tweets—from when he was a struggling youngster in the Scottish lower leagues—also provide perspective.